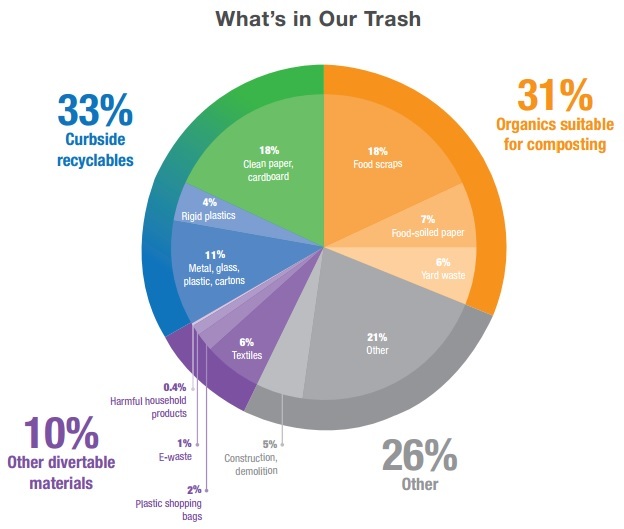 New York City generates 1.8 million tons of commercial and residential organic waste. The Big Apple is facing this waste diversion problem head-on. In 2012, then-mayor Michael Bloomberg committed to doubling the amount of waste the city recycles or composts. In December 2013, NYC passed its Commercial Organic Waste law (Local Law 146), which took effect July 1, 2015. This law mandated specific large-scale generators to arrange for the recycling of their organic materials or employ department-approved methods to process the material themselves. NYC’s Bureau of Waste Prevention, Reuse, and Recycling is responsible for enforcing the law. This series of legislative actions are expected to have an impact that reaches well-beyond NYC’s five boroughs, as the country’s largest city sets an example on a national stage. Of particular interest will be the effect this law will have on the well-established community composting infrastructure that already exists in the city. Under Local Law 146, the Commissioner of the NYC Department of Sanitation will determine on an annual basis whether there is sufficient capacity within a one hundred mile radius of the city to process the organic waste being generated. In addition, the Commissioner will determine whether the cost of processing organic waste is competitive with the cost of disposing of organic waste by landfill or incineration. As organic waste processing capacity increases within the region, the Commissioner is able to phase-in the requirement of an increasing number of commercial enterprises to source separate their organic waste. Note: all references to square feet refers to floor area. Private carters will be required to deliver collected organic materials to either a transfer station or directly to a facility for composting, aerobic or anaerobic digestion, or other department approved processing. Transfer stations that accept source-separated organic materials will also be required to deliver or arrange for delivery of these materials to a facility for composting, aerobic or anaerobic digestion, or other department approved processing. The provisions of NYC’s Commercial Organics law relating to private carters will be enforced by the NYC Business Integrity Commission. The provisions relating to covered establishments will be enforced by the NYC Sanitation Department, the NYC Department of Health and Mental Hygiene, and the NYC Department of Consumer Affairs. After a twelve month warning period, any covered establishment, transfer station, or private carter that violates the Commercial Organics Law will be liable for a civil penalty recoverable in a civil action that may amount to $250-$1,000 per violation. Commercial organics generators had until mid-2015 before the above requirements became effective, but a few pushed to the head of their class by participating in former Mayor Bloomberg’s Food Waste Challenge. The Mayor’s Food Waste Challenge invited New York City private sector groups to voluntarily participate in reducing the amount of food discarded by committing to a 50 percent food waste diversion goal. The Mayor’s Office of Recovery and Resiliency reported that in the first six months after the launch of the challenge, the program resulted in an immediate reduction of 2,500 tons of food waste. Outside of the Mayor’s challenge, the NYC Dept. of Sanitation launched an organics collection pilot program for residential collection in 2013. As of 2016, it has since expanded to serve several other neighborhoods across the metropolis. According to the Department’s 2014-2015 Report, the organics pilot program collected more than 100 tons of residential organics each week. This resulted in NYC Sanitation recovering a total of 15,000 tons of food scraps and yard waste from schools and residences over the course of these two fiscal years.